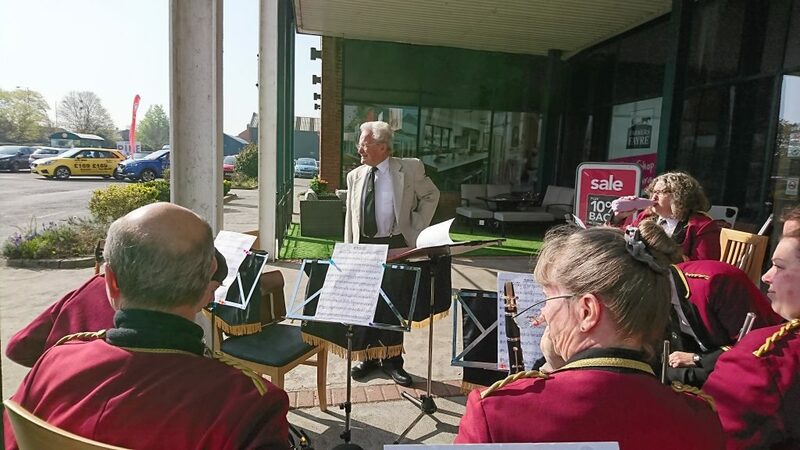 We had a delightful time playing in the outer foyer of Leekes to entertain bank holiday shoppers visiting the store in the surprisingly summer April morning. Our tunes included Elvis Presley: “Always on my Mind”, Robbie Williams: “Have You Met Miss Jones” & “Mack The Knife”, Frank Sinatra: “My Way”, Fool’s Garden: “Lemon Tree”, “Basin Street Blues”, Beach Boys medley, “Teddy Bears’ Picnic”, “March: 1919”, an Italian medley and other songs. We ended our set with “We’ll Meet Again”; it would certainly be great to be invited back next year! We were delighted to play for a private audience a mix of our upbeat tunes followed by Christmas songs; taking many requests and fulfilling them to the enjoyment of all. It was a fantastic evening with both the band and guests having lots of fun – we hope to return next year! We were happy to return to the Centre Parcs venue for another mix of songs to the delight of the families on holiday and our conductor, Alan, performed the bugle call at 11am. The Central Methodist Church, Chippenham was the perfect place to play our part at a memorable event, 100 years on from the loss of Chippenham lives in the 1st World War. Although there was a distinct chill in the air, there was a great turnout of people enjoying the park and our music. John Coles park was a cheerful place with people playing fetch with dogs, flying kites, cycling around the bandstand and sitting on benches enjoying ice cream. Whilst it was rather windy the potential rain held off and we had a brilliant concert to end the summer bandstand season at Chippenham. We played several marches “Barnyard Castle”, “Musket, Fife and Drum” and “Blaze Away” which are always well received. 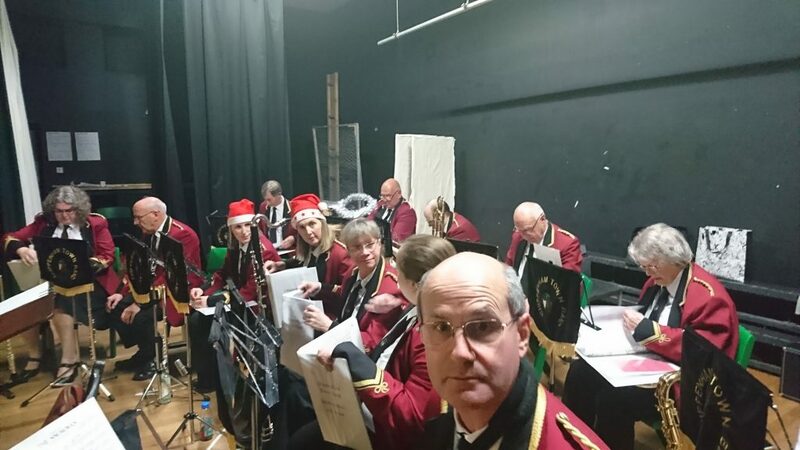 We also played medleys of familiar tunes including “Beach Boys” and “Viva Italia”, some swing pieces such as “Cheek to Cheek” and songs to dance by – with our own conductor going off-stage to dance to “Rock Around the Clock”. I wasn’t certain if anyone joined in with the motions for “Loco-Motion” and the YMCA part of “Disco Lives” but I heard a few sing along to “Tequila”! Some film music made it to the mix including “Toy Story 2” and “Pirates of the Caribbean”. Despite an overcast day, there was a tremendous turnout of people attending the fair and it’s various stalls. Morris dancers also entertained (thankfully far enough away so our music didn’t clash!) 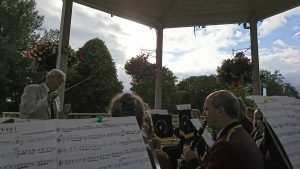 We played a variety of pieces with the crowd applauding most the RAF March Past and Viva Italia medley. I couldn’t tell if anyone joined in on the YMCA or sang along with Tequila as I was concentrating on playing! Our two sets were at 12:30-13:30, 14:30-15:30 in front of the war memorial. 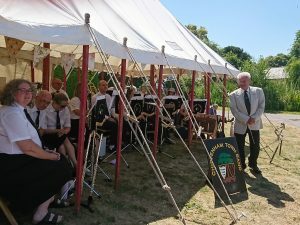 Some ex-band members were a pleasant sight in the audience and band members’ families enjoyed the afternoon too. The National Trust car park, even with diligent car park attendants, had a queue almost back to the A350 before 12:00 so try to head over earlier if posssible. Lacock Church itself is a great source of tea, coffee and generous portions of cake – all for a good cause. Whilst not quite the deluge of our concert last September, the weather was a drastic change from the bright sunny weather of recent weeks; threatening to rain and strong winds! A valiant crowd still joined us for an afternoon of tunes. We mostly played marches and theme tunes. During the YMCA portion of “Disco Lives” a gust of wind caught several stands and instrument cases but we managed to play on! Another superbly sunny afternoon for a splendid fete. Lots of stalls, vintage cars and even a family dog show. It was delightful to see so many dogs out and about! This was our second year to be invited to play at Tockenham and we enjoyed every second. We played following the 2pm opening announcements, had a brief break for sandwiches, tea and delicious cake then continued until gone 4pm. Our repertoire included Beach Boys, Moon River, Toy Story 2, Mondo Glissando, A Bridge Too Far, Fly Me To The Moon, Barnyard Castle and Locomotion to name but a few. The afternoon was bright and hot; we were very grateful for our marquee! There was a great turnout of locals attending the fete with a variety of stalls ranging from face painting to cream teas. 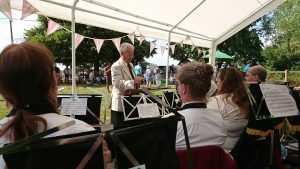 We played marching pieces Barnyard Castle and A Bridge Too Far as well as relaxing tunes including Moon River, My Way and Can’t Help Falling In Love. We also played various lighthearted songs such as Viva Italia (medley), Beach Boys (medley) and I’ve Had The Time Of My Life. Finishing as per tradition with We’ll Meet Again; looking forward to next year!